In 1908 J. B. Firth wrote: "The church, alike inside and out, is of great interest, and its graceful tapering spire enjoys as much local fame as the tower of Ashbourne ". "When the Roundheads had finished their work of destruction they sang a hymn - one of exultation doubtless - and marched down to the church in Ashover. The rector followed - just allowing them to get a discreet distance ahead - and found to his great surprise that Scout-Master Smedley was in the pulpit, where he preached a sermon two hours long against Popery, priestcraft, and kingcraft. "But Lord,", continued the rector, "what stuff and nonsense he did talke, and if he could have murdered the Kyng as easily as he did the Kyng's English, the war would long have been over." When the sermon was done, and the troop was preparing to set off, some one drew attention to the old stained-glass windows representing the Crucifixion. Mattocks and bars were brought, and the windows and stone work broken to fragments. They then ransacked the vestry, and finding a few prayer books and the parish registers, they made a bonfire with them in the market place and rode away singing another psalm. 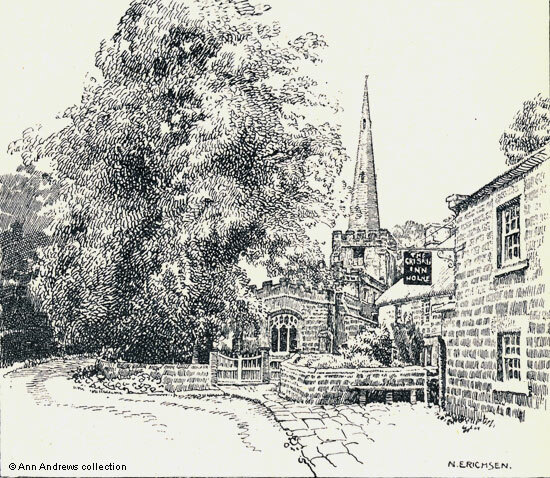 The rector, to whom we owe this interesting account of wanton mischief wrought in Ashover during a long summer day, survived his misfortunes for many years. He died and was buried in Leicestershire. Thus he had no monument in Ashover Church, though there is one to his son Obadiah, who succeeded him as patron and rector, and there are many memorials of his descendants, of his name and the name of Nodder ". Rev. Cox wrote in 1875 that lead fonts are uncommon and suggested an earliest date of around 1150 for the one at Ashover. It is circular and embossed, with twenty figures standing beneath semi-circular arches, each holding a book in the left hand". 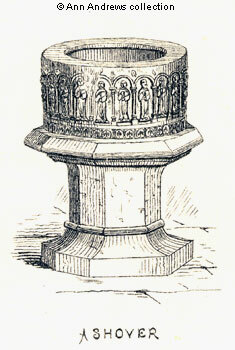 The post war architectural historian Nikolaus Pevsner said it was the most important Norman font in the county. He added that the bowl is very small - only two feet across . The brother and sister of my 3Xg grandmother, John and Elizabeth Nuttall, would have been baptised at this font in the 1780s. This blocked up north doorway, with "an ogee-shaped arch and pierced projecting tracery " is of the Decorated period, so dates from the middle of the 14th century. The south doorway (not shown) dates from the reign of Edward I but "the rest of the fabric is of the 15th century". 1. Illustration by Nellie Erichsen from Firth. 2. Images of Font and North Doorway have been extracted from Cox . 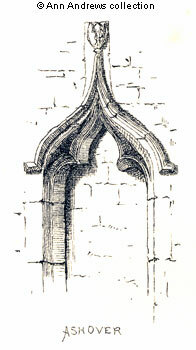 The drawings of the font and the doorway were from drawings by Mr. Bailey and others (not named) and from plates produced by Bemrose of Derby. Firth, J. B. (1908) "Highways and Byways in Derbyshire" MacMillan & Co., London. The quotations from Immanuel Bourne were contained in a letter he wrote in 1646 to a cousin in Manchester. Illustrations from the same book. Cox, J Charles (1875) "Notes on the Churches of Derbyshire Vol I" Chesterfield: Palmer and Edmunds, London: Bemrose and Sons, 10 Paternoster Buildings; and Derby, The Hundred of Scarsdale. Pevsner, Nikolaus (1953) "The Buildings of England. Derbyshire", Penguin Books, Ltd.